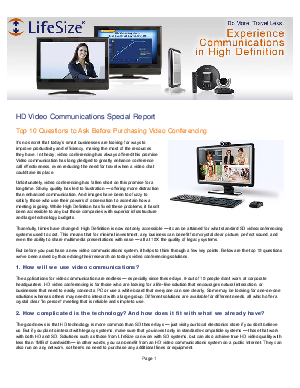 High Definition is now not only accessible — it can be attained for what standard SD videoconferencing systems used to cost. This means that for minimal investment, any business can benefit from crystal clear picture, perfect sound, and even the ability to share multimedia presentations with ease — all at 10X the quality of legacy systems. But before you purchase a new video communications system, it helps to think through a few key points. Below are the top 10 questions we've been asked by those doing their research on today's video conferencing solutions.